Nathan joined Cornerstone Capital Advisors in January of 2017 as a member of the Portfolio Administration team. He works closely with our Advisor and Analyst teams in order to serve clients in every aspect of account administration. 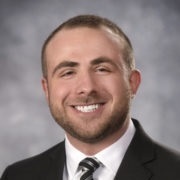 Nathan graduated from The University of Akron in 2016 with a Bachelor of Business Administration in Financial Services and a Bachelor of Science in Accounting. While in school, Nathan completed his honors research project which examined how well students understood basic personal finance issues, and explained how The University of Akron can do a better job educating their students on the most important and fundamental personal finance concepts that will influence their decisions throughout the rest of their lives. Nathan is also involved in his community as an active member of his church and their outreach programs. Nathan is currently pursuing the CERTIFIED FINANCIAL PLANNER™ designation.